Peterborough Phantoms ended 2014 on a low note by slipping to defeat in their final English Premier League clash of the year last night (December 27). The city team, without injured forward Marc Levers and ill defenceman James Hutchinson, paid the price for conceding too many penalties as they went down 5-3 at the hands of Sheffield Steeldogs at IceSheffield. Import forward Milan Baranyk bagged a brace of goals before being thrown out in the closing stages for an accidental high-sticking offence. 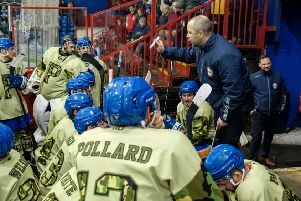 Home player-coach Andre Payette had been dismissed in a similar situation in the opening period. Phantoms boss Koulikov said: “It is a disappointing way to end the year and certainly not the result we were looking to pick up. “We were short-staffed as a team and found ourselves killing far too many penalties in the early part of the game. “Both teams played a physical game and you get penalties when that happens, but it took a lot out of the guys. Phantoms endured a nightmare trip north as their late arrival caused the face-off to be dalyed, but they made a rip-roaring start when the puck was eventually dropped as Baranyk struck the opener after just 24 seconds. But that effort was cancelled out by Ashley Calvert during a first period littered with penalties and halted 48 seconds early after a dust-up between Phantoms man Mason Webster and home enforcer Callum Pattison left blood on the ice. The hosts moved into the driving seat in the second stanza thanks to goals from Lloyd Gibson and Lee Haywood while only some superb work from netminder Janis Auzins prevented Phantoms from falling further adrift. Baranyk’s second brought them back into contention and the pipes prevented them from levelling early in the final session. Phantoms twice struck the frame of the goal before the hosts made a powerplay count through Tom Squires. Luke Ferrara again reduced Phantoms’ arrears but a late strike from star Sheffield import Janis Ozolins eventually saw them off. Phantoms end the year third in the league standings after being leapfrogged by Guildford during the festive period. The two teams are currently level on points, but Guildford boast a slightly better head-to-head record. Phantoms entertain Billingham in an English Challenge Cup clash at Planet Ice tonight (December 28, 5.30pm). Koulikov will finalise his team plans close to face-off but again intends to use several young players from the Islanders and Under 18 teams. The result of their abandoned clash in Billingham last Sunday (December 21) will stand as a 2-1 Phantoms victory.